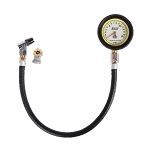 Possibly the best deal out there in a 2-3" tire gauge, this Joe's Racing Gauge iS loaded with features. Easy to read markings every PSI. Comes with a "ball type" AND "angled" style in the package! *All analog gauges are the most accurate in the middle of their operating range, so you want to select a range that will allow you to operate in this range. E.G. 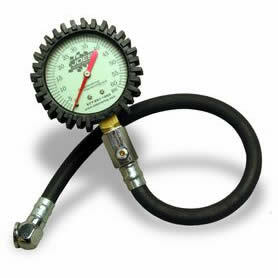 if you run around 15psi in your tires, a 0-30psi gauge would be the most accurate for you. Most street type cars/tires are in the 25-45psi range and should use a 0-60psi gauge.